San Antonio Steel Company offers a variety of woven wire field fences with a hinge joint wrap. Both low carbon and high tensile field fences are offered in a wide variety of heights and styles featuring graduated spacing that starts with narrow openings at the bottom which prevents the entry of small animals. The hinge joint knot is found on both low carbon and high tensile products. 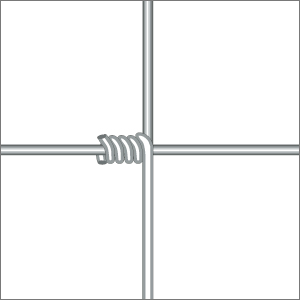 This is the most common knot in agricultural fencing. The knot is formed by wrapping the vertical stay wire pieces around the line wire at each intersection. This design can also absolve animal impact without damage and is the most economical knot choice available. Low carbon field fence is made from steel rod with a carbon content of approximately 0.10% making it fairly forgiving and easy to work with. Because of its elasticity, it is prone to elongation over time and is not as strong as high tensile wire. We call it the official fence of Texas. It’s tough, honest and dependable – characteristics typical of Texas that deliver the proven performance that farmers and ranchers expect. 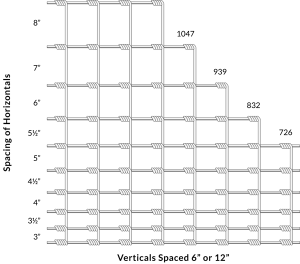 Woven wire is available in a variety of heights and configurations. Understanding the product description will help you select the right fence for your job.